As you view your website's Google Analytics, you may have noticed a metric called Bounce Rate. 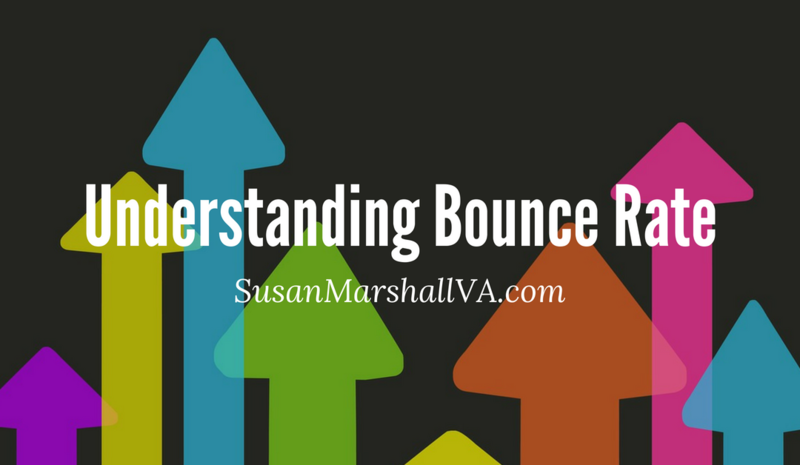 Have you ever wondered what does bounce rate mean? This is the percentage of visitors who have arrived at your website on any single page and left your site from the same page without visiting any other pages. The bounce rate is displayed as a percentage for the entire site and can also be viewed for each individual webpage. There are several contributing factors to a bounce rate and the most common assumption is that a lower bounce rate is best. There may be instances where a high bounce rate is not bad, but for this post let's assume we want a lower bounce rate. We want our visitors to be more engaged, spend some time on your site and lead them through a conversion funnel toward a conversion goal. What Can Cause a High Bounce Rate? If you have a high bounce rate, try looking at a few of the common culprits listed here to see if any might apply to you. If you suspect any of them, try making a change and review your bounce rate for trends and signs of success. If your keywords have not been researched and/or your web pages have not been optimized for them, you might want to start here. This takes a little time but could make a big impact. My suggestion is to begin your keyword research and then optimize your site, one page at a time. A great service for researching keywords is KWFinder by Mangools. You can even sign up for a free account with no credit. If a visitor might have found your web page content to be bookmark worthy, meaning they want to get to it again easily and quickly. A visit via a bookmark, with no other page visited afterward, will count as a bounce. Another scenario is a visitor found your website via a search query, got the information and answers they were looking for and then left. In these cases, there is really not much you can do. One suggestion I've read is to split up longer posts into smaller more digestible pieces. Visitors with shorter attention spans might also appreciate this. This could encompass many factors like confusing or missing navigation, a visual layout that does not appeal to your target audience, a slow-loaded site, annoying pop-ups, no visual interest like color contrast and images, autoplay audio and video, and more. Think about browsing the web and the reasons why you avoid some websites over others. What draws you in and what pushes you away? Are you doing any of these things on your own website? Have you defined your goals for your site? Is your website meeting those goals? What is your conversion funnel? Once you know what your message is and what you want your visitor to do, make it easier on them by stating your message clearly. You can do this with taglines, page titles, headlines, lists, bold text and more. Guide your visitor along your conversion funnel and don't forget the call to action. There is more than one bounce rate for your site. The first or overall bounce rate is a quick indicator of whether or not you're giving visitors what they want. To get a better idea of what action to take, you have to look deeper and evaluate the bounce rate of individual keywords, referral sites, and individual pages. To get an even better understanding of bounce rate you might want to view this short 5-minute video by Google Analytics.